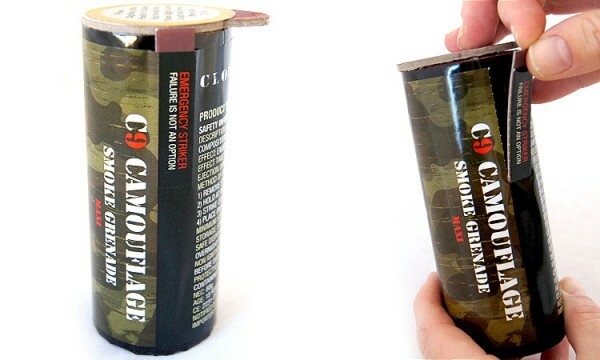 Our original Camouflage grenade is a premium high volume smoke. It provides a thick dense cover with a huge coverage of 125 cubic metres for the ultimate camouflage. The grenade is easy to use, with a simple striker for ignition but more importantly it's reliable and won't disappoint players. Available in 4 vivid colours: white, green, yellow and red. Underneath the Cloud 9 Combat label is a spare striker which can be removed quickly and easily. While others swear over an unlit and useless grenade, Cloud 9 Combat grenades will give players the tactical advantage they want. Added to this we have re-designed our grenade ditching the shiny metallic and replacing with our new camouflage labelling!